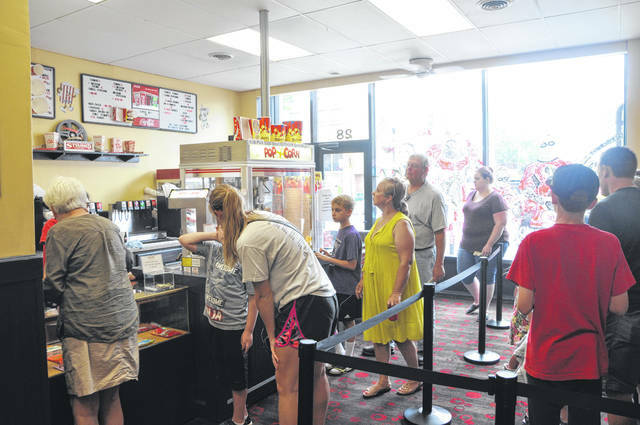 Attendees of the free summer kids movie get concessions before the afternoon screening Tuesday. 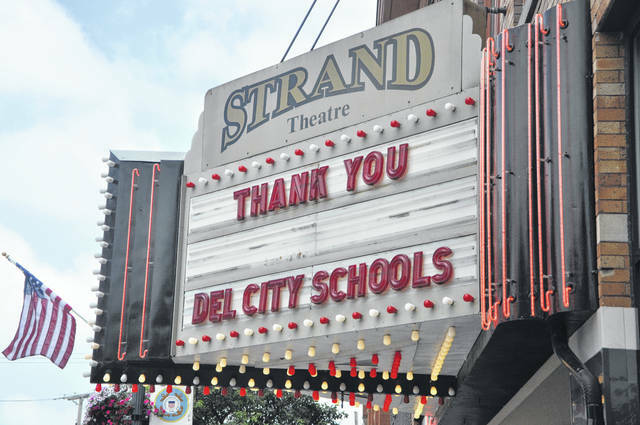 The marquee at The Strand Theatre in downtown Delaware thanks Delaware City Schools for sponsoring Tuesday’s free summer movie, “Wonder.” The showing was free, and donations went to People In Need of Delaware County. The Strand Theatre in downtown Delaware held two free screenings of “Wonder” Tuesday in partnership with Delaware City Schools and People In Need, Inc. of Delaware County as part of the long-running Free Summer Kids Shows. Delaware City Schools sponsored the free showings of “Wonder,” while attendees were encouraged to give to those in need by donating nonperishable food items to People In Need. Strand Theatre Managing Director Tracey Peyton said the morning showing of the film played in all three theaters because of the crowd. Peyton added the school district has been very supportive of the film, which centers around a young boy with Treacher Collins syndrome as he tries to fit in at school. She said when the film came out last year, the school district bought out a showing. Delaware City Schools Superintendent Paul Craft said if there’s one message the district can get behind it’s everyone having a safe place to learn. Craft was on hand Tuesday with other school officials to box the donations for People In Need, and he added the district was happy to sponsor the showings. “We are so blessed to have The Strand’s support,” Craft said. By the end of the event, People In Need had collected about a dozen boxes of canned goods according to Randy Bournique, the associate director of People In Need, Inc. of Delaware County. Bournique said the event shows children that it’s important to give back. The next free summer kids movie is “Captain Underpants” on June 26 at 11 a.m. and 2:30 p.m. Andrews House is partnered with the film and is asking for donations of toiletry and personal care items, paper products, and individually wrapped snack food.